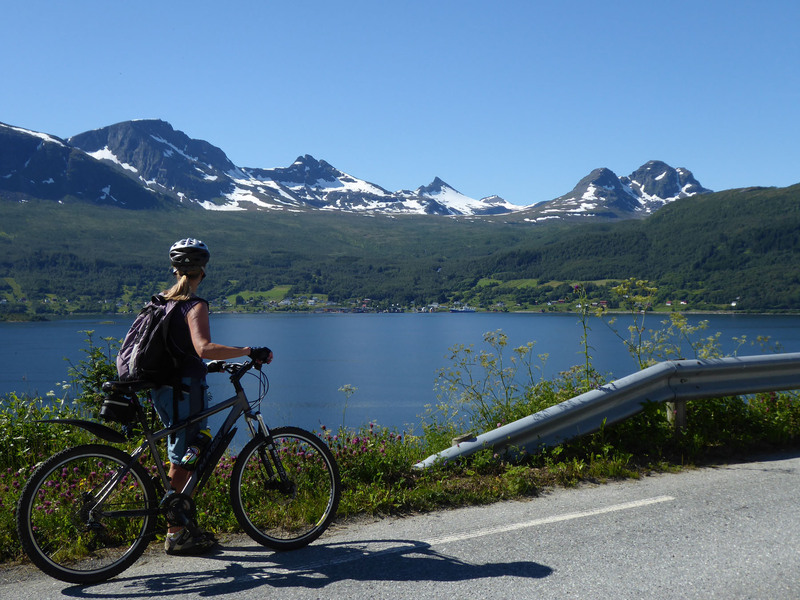 Enjoying a few restful, lazy days around Gratangsbotn & Årstein, on the banks of a calm fjord. We moved on the next morning from Senjatrollet, again following the tourist route road. We first called into the tiny hamlet, or rather the hotel and fishermen apartments, of Hamm, and had a short walk around their pretty marina front, watching a few beginners have kayaking lessons in the still, protected water. From here we drove all the way to Gryllfjord, just to have a look. As we arrived at the end of the road, staff on the about-to-leave ferry wildly gesticulated to us that we could quickly sneak on if we wanted. We didn’t, although annoyingly if we had wanted to, we’d no doubt have been patiently waiting in the queue from several hours ago. 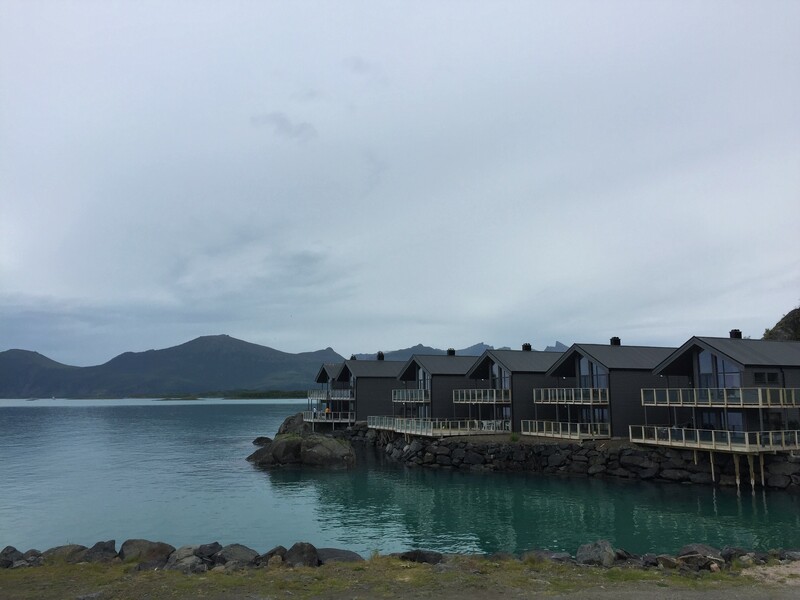 We returned the same way, as the only way forward was that ferry to Andenes. Instead we drove inland, to the town of Finnsnes where we paused for a bite of lunch. After lunch we went hunting for LPG, and at a junction near Bardufoss we found exactly what we were after – 11kg propane – and they even accepted our old, empty Spanish gas bottle in exchange (Norway and Spain have the same top connection) so it only cost us €25 for the refill. This was our first gas purchase on this trip, and a happy result for us given the high prices we’d been quoted in Sweden. 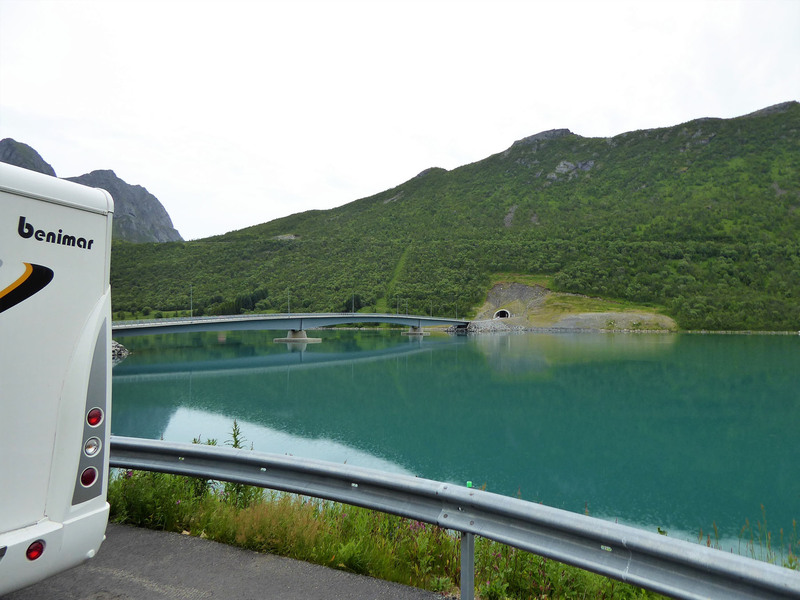 After a few more hours driving, through mostly built-up townscapes and unusually scruffy countryside, we arrived in an aire at Gratangsbotn, a picnic spot set in front of a rather empty and sadly neglected looking hotel. 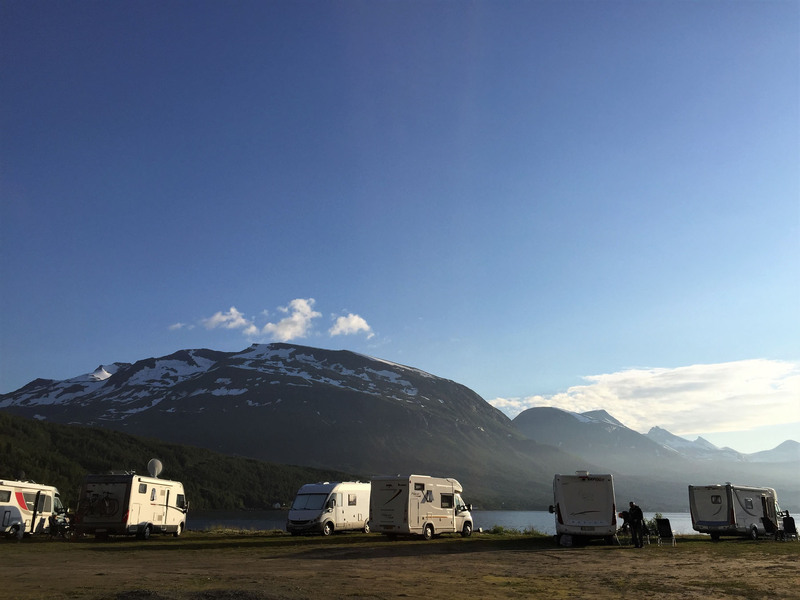 There were other motorhomes around when we parked up, but one by one they all disappeared down the hill and left us to enjoy the beautiful view over the fjord all by ourselves. The sun set slowly into a pink bath as we enjoyed the peaceful quiet of this stop. The next morning, with the sun brightly lighting up the view below from a cloudless sky, we rolled down the hill about eight miles to another nearby aire in Årstein. 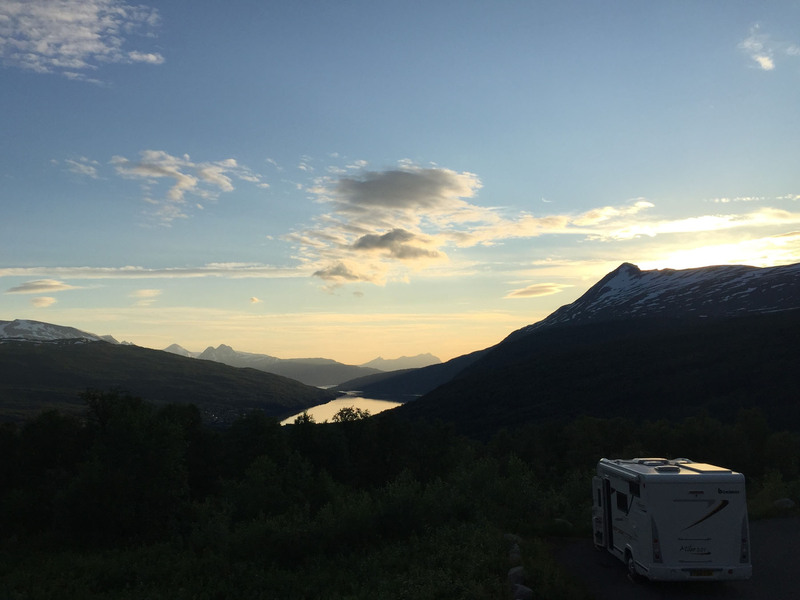 We parked up right on the edge of the same fjord we had been admiring from afar, on an area of rough gravelled ground by the base of a bridge. There was a line of motorhomes already in residence, haphazardly parked along the edge, all bar one looking out over the water. We had arrived in our chosen aire very early and now planned a very lazy down day, sitting in the sun and relaxing as we watched the light slowly change on the distant peaks. Our one exertion of the day was to wander slowly across the bridge to the town of Årstein, where we found a Spar and bought some fresh bread. The next morning we had initially planned to move on again, but changed our mind early on. The day was beautiful, the aire peaceful and we had no place else to be. Also, it had been 3205 miles, three countries and 51 days since we had last cycled, back at Guldbæk Vingård in Denmark, and it was time to change this; the poor bikes must have thought we’d forgotten about them. The weather was kind, we had a full day to play, so why waste it? We removed our bikes from the garage and, after some loving maintenance and a thorough garage tidy, we set off. 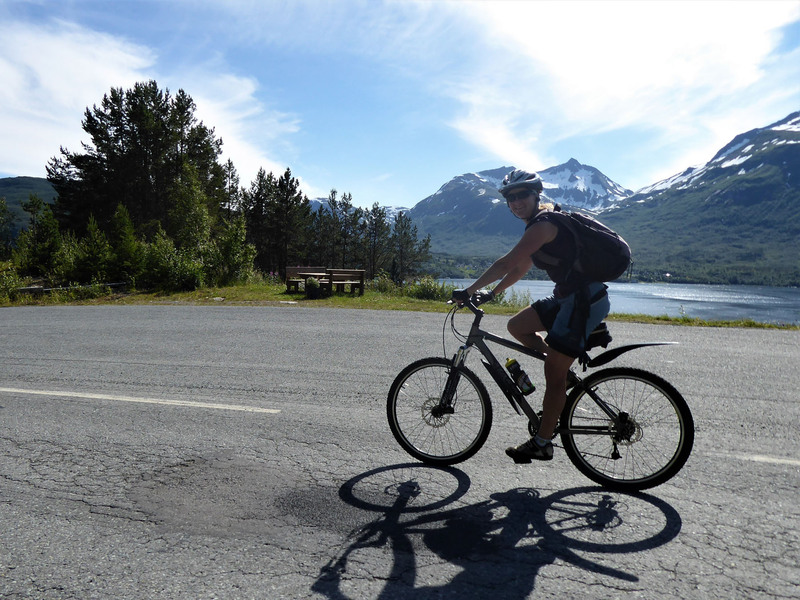 We first crossed the nearby bridge and followed the coast of the fjord anti-clockwise and north. 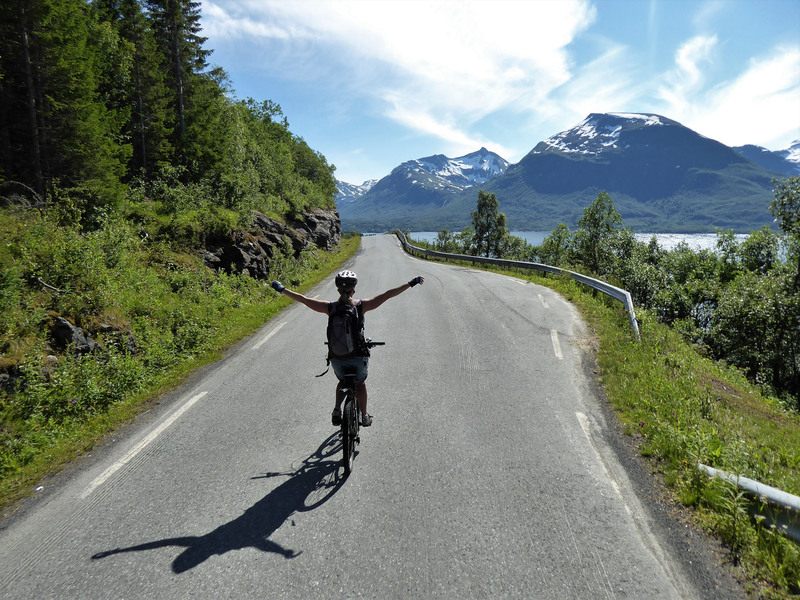 The cycling was hard work, our lungs felt and sounded like old, rusty cylinders being rubbed down with sandpaper. We were rasping and gasping on what were really only minor inclines, amazed at how desperately we were lacking bike fitness after only seven weeks out of the saddle. Our efforts were being rewarded with a beautiful backdrop of jagged peaks, splattered with patches of snow that sat high above a tree line that formed a solid green band between the bare rock and the sea. 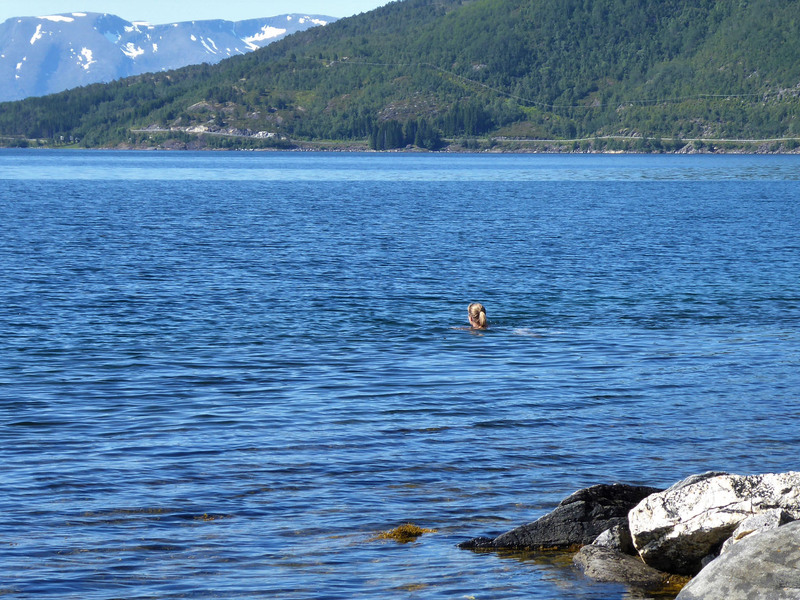 The water in the fjord was a milky green-blue, shimmering in the sunlight when the light wind ruffled the surface. 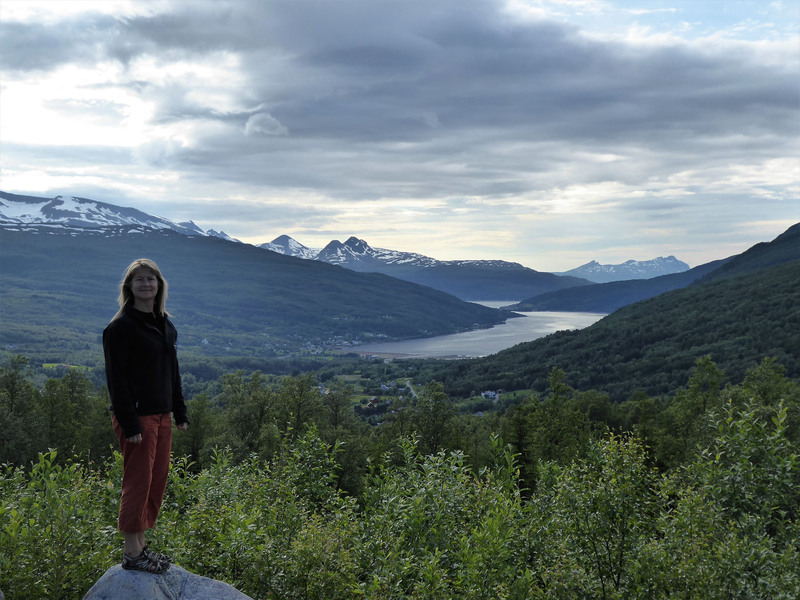 We rolled through a few settlements until we found a narrow cut path through some high grass, snaking down a steep hill that led, we hoped, to the banks of the fjord below. 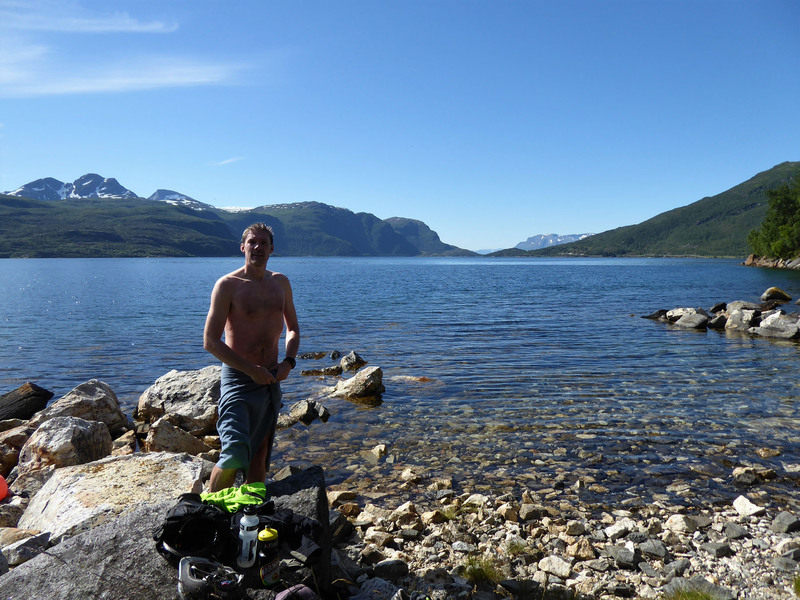 We abandoned our bikes near the top of the slope and walked down, eventually finding a small beach area and an old timber fishing hut – a perfect spot for a sneaky fjord dip. We stripped off, carefully crossing the jagged stones before gently easing ourselves into the cool water, feeling instantly refreshed. The slightly salty water was sharp and cold, but clear and invigorating and we splashed around for a few minutes, enjoying the cleansing thrill after our sticky hot cycle. We quickly dressed to avoid the attention of the persistent flies our presence had intruded upon, and re-climbed the steep path to reunite with our bikes. We returned along the same route, our lungs better up to the task this time, and spent the rest of the afternoon seal watching in the bay. One ‘seal’ we spotted from afar, on closer inspection, became a fully hooded snorkeller, with long fins, slowly making his way along the bay inspecting the bottom – for what, we had no idea. It was really good to have a few relaxing days of easy sunshine, to recharge and relax. 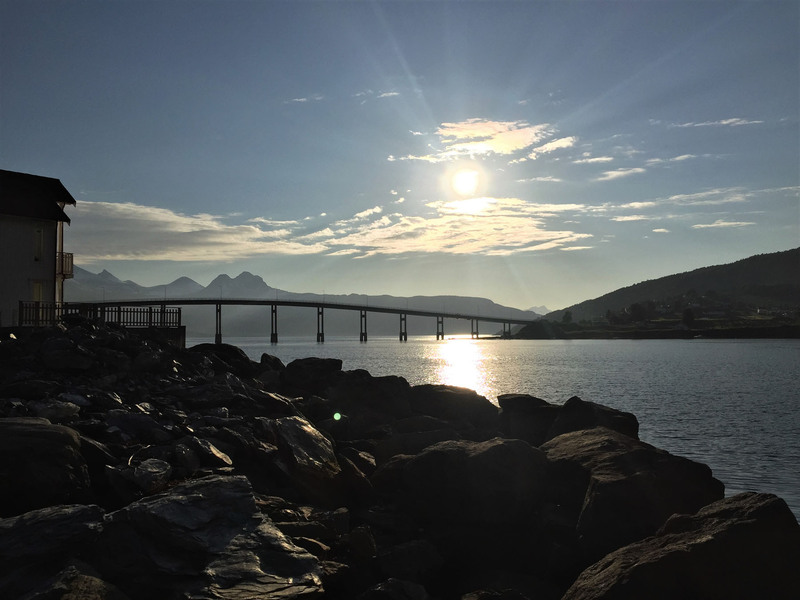 Our next stop was at another WorkAway project, deep in the Vesterålen islands, where we would hopefully have some fjord kayaking opportunities alongside our other duties, so we wanted to be rested and ready. 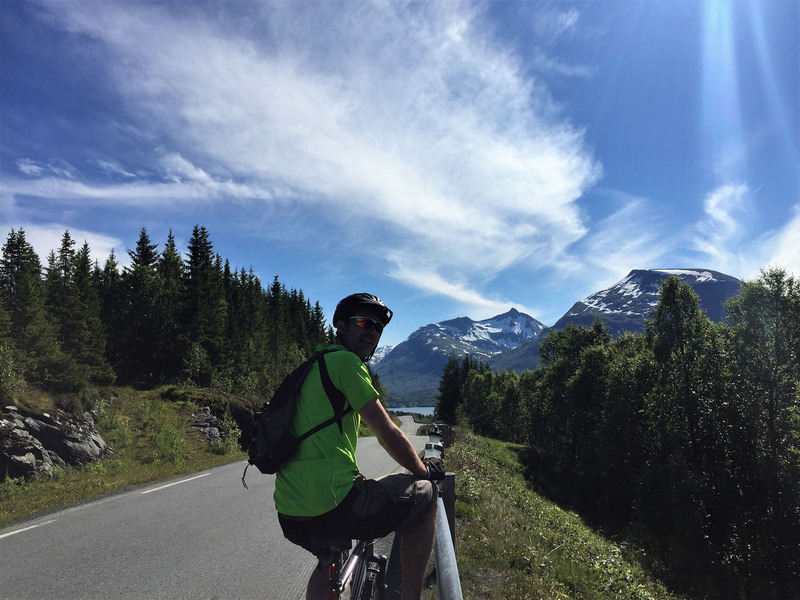 This entry was posted in 2017 Scandinavia Tour, Cycling, In Norway, Norway, Our Travel Journal, Swimming on Aug 3, 2017 by Aaron Hill.